Odisha is a land of arts, crafts, literature, dance and music. The people of Odisha have always expressed their quest for creativity in any and every form. 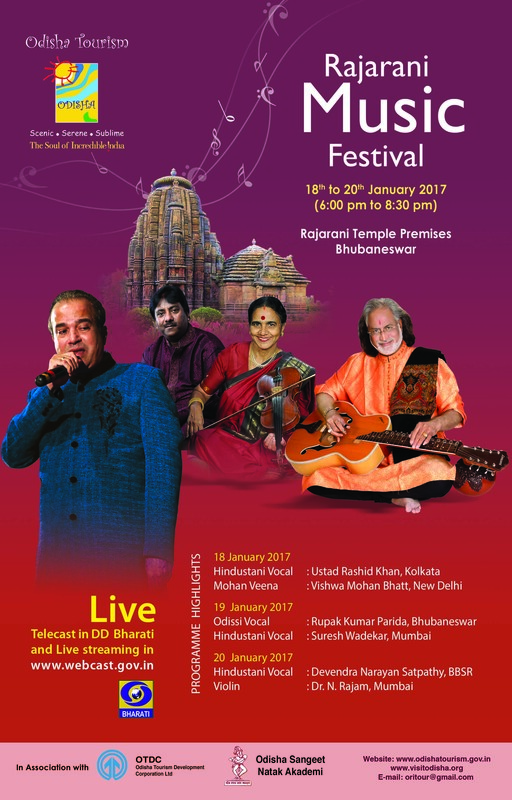 The Rajarani Music Festival held in the beautiful courtyard of the Rajarani Temple in Bhubaneswar is one such occasion to celebrate the richness and originality of Indian classical music. Odisha Tourism has been organizing the Rajarani Music Festival from the year 2002 against the backdrop of the of the 11th Century Rajarani Temple in Bhubaneswar. It is an evening of concerts which is relaxing, entertaining and uplifting. This is a festival of classical music of India organized for three days. Initially this festival was organized in association with Odisha Sangeet Natak Academy. From 2006 this festival was organized by Bhubaneswar Music Circle till 2011. During 2012 this festival was again organized by Odisha Tourism in association with Odisha Sangeet Natak Akademi. This year the festival will be organized by Odisha Tourism in association with OTDC and OSNA. The objective in organizing such festival is to showcase the cultural heritage of our State in particular and country in general so as to attract more tourists. Evening concerts by great maestros of Indian Classical music fill the air with enchanting flavour. Renowned and celebrity artistes like Ustaad Abdul Halim Jaffar Khan, Sanjeev Abhaynkar, Pandit Hari Prasad Chaurasia, Sushri Meeta Pandit, Pandit T. N. Seshagopalan, Ustad Baha-ud-din Dagar, Ustad Sahid Pervez Khan, Ustad Dilshad Khan, Begam Perween Sultana, Padma Bhusan T. N. Krishnan, Rajan Mishra & Sajan Mishra, etc. have already performed their classical music extravaganza in previous years in this festival.